If you had asked me in November 2009 where Pineville, Louisiana was on a map, I would been unable to answer. Located in the middle of the state, Pineville is a suburb of Alexandria and that’s a problem. For me, Louisiana is divided into two main sections. The first section is the north and all parts accessible by I-20. The second is the south and all parts accessible by I-10. That makes Pineville just another place I never had any real intention to visit. So, why have I been making a number of trips to Pineville in the past year? Well, it’s a canine reason. My parents wanted a corgi and I was more than happy to find a breeder. It just so happened that I stumbled upon a great one in Pineville, Louisiana. In the early months of 2010, a number of trips were made to and from Pineville, but it wasn’t until this last one, the fourth, that I stopped for lunch. I was hoping for something tasty and local so I naturally asked the breeder. He directed me to Po-Boy Express. 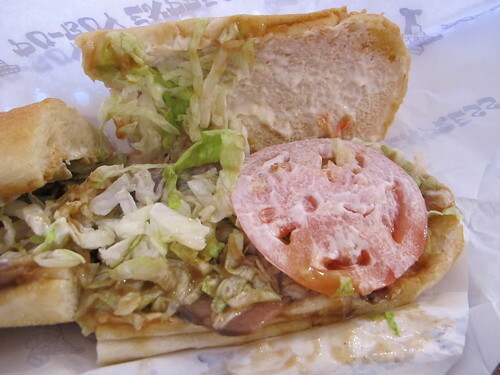 There’s not much to say about the inside of Po-Boy Express. It’s a mix of Saints and LSU paraphernalia with a few items from the local college mixed in. Having moved into a new building just a few years ago, the current Po-Boy Express hasn’t had time to develop the patina that graces so many great po-boy restaurants. What Po-Boy Express does have is a rather lengthy menu. Consisting of more than 40 different types of po-boys the menu really does seem to have something for everyone. As with most specialty menu, I have a few standards that I use as a sort of litmus test. 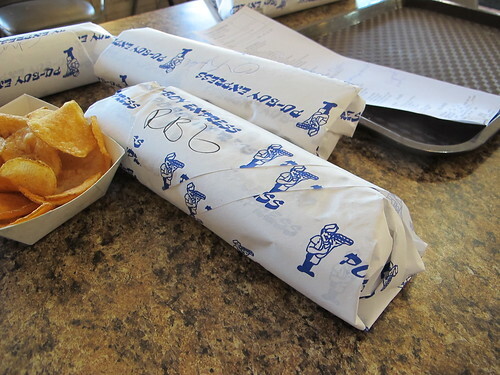 In the case of the po-boy that usually means a roast beef po-boy and some fried seafood, either shrimp or oysters. 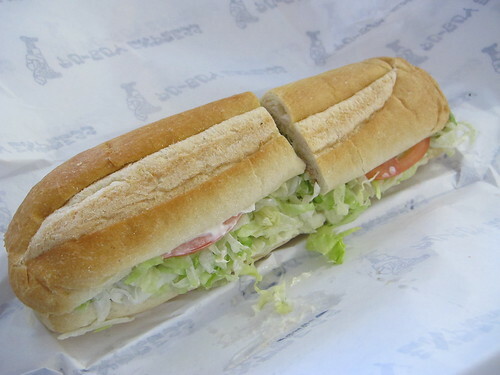 It may not be the best system, but those po-boys are generally good indicators about the restaurant’s quality. With my order placed, it was only a matter of time before the first portion arrived. 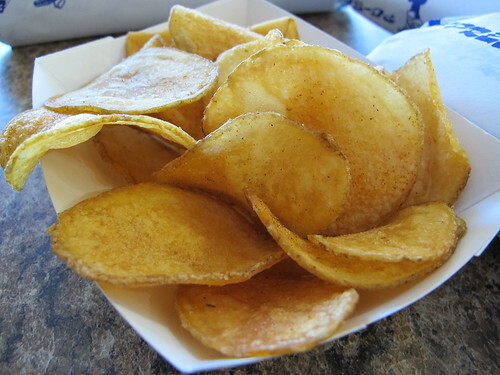 Beating the po-boys to the table, an order of Po-Boy Express’ homemade potato chips was the first to arrive. Being in Louisiana, I was half expecting some sort of spicy, Cajun seasoning on these chips, but that wasn’t the case. What I did find was a pretty solid order of chips. Well fried and crispy, but a little light on the seasoning, this was a perfectly suitable order of chips. 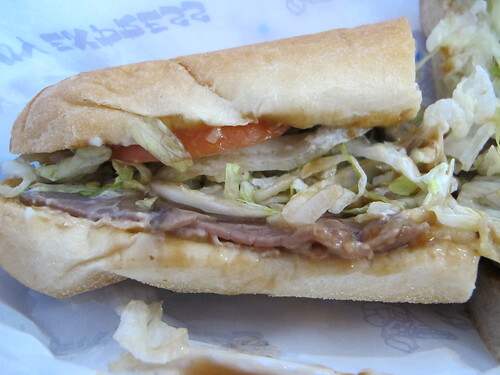 I hold a special place in my heart for the classic New Orleans roast beef po-boy, so I almost always have unreasonably high expectations for that loaf of roast beef and gravy. 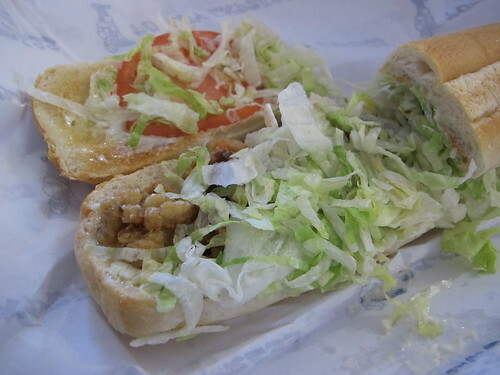 Of course, labeling your po-boy as New Orleans style only reinforces my expectations. I asked the cashier what sort of bread they used and as best as I could understand, Po-Boy Express uses Checko bread. I have no idea if that’s the correct name, but it was an odd loaf of po-boy bread. There wasn’t any real crunch to the crust; it was just a soft hoagie roll. There’s your usual assortment of po-boy dressings at work: tomato, lettuce, and a healthy slathering of mayo. On its own, the roast beef was covered in hearty gravy that more than covered the mediocre roast beef. Once everything was dressed and mixed with a little salt, pepper, and hot sauce, the gravy and mayo really came together to make a decent filling. This roast beef and gravy po-boy certainly won’t be winning any awards, but it’s a nice alternative to the banality of fast food. Hoping to find the same satisfying results that I had with the roast beef and gravy po-boy, I moved on to the oyster po-boy. 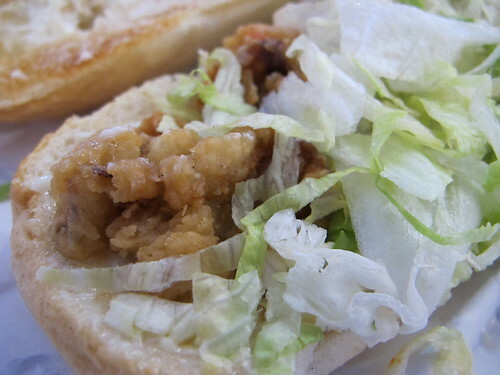 Ah, a gulf oyster knows no better home than to be fried and served on a quality po-boy. 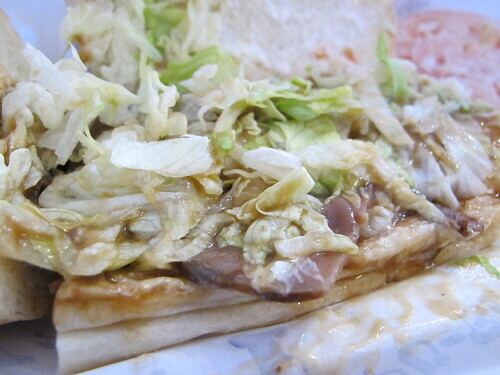 From the beginning, there was something wrong about this po-boy. The oysters were heavily breaded, but crispy from frying. Moving past the texture, instead of a juicy touch of salinity with each bite, these oysters tasted overcooked and flat. The oysters could have been halfway saved with a liberal dose of hot sauce to the mayo, but when combined with the sorry excuse for a po-boy loaf, everything fell apart. Unlike the roast beef po-boy, there’s no gravy to hide behind here. This was just a bad oyster po-boy. I realize that it’s unfair to judge a restaurant based on just a few items from their relatively expansive menu, but that’s exactly what I’m doing. Of course, there is a need to put things into perspective. Compared to the litany of fast food options that my host first recommended, Po-Boy Express was a poor man’s Shangri-La. One should also take location into account. It’s unreasonable to expect the excellence of Cajun food from Lafayette or the high quality po-boys of Nola in the middle of the state. 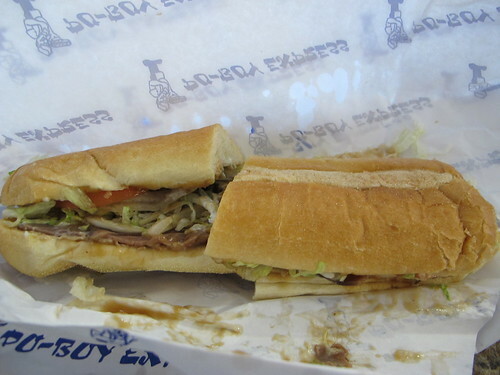 So with that mind, Po-Boy Express might be a pretty fair option, but when compared to the standard bearers, Po-Boy Express is mediocre at best. Next time you visit, you should really try the Cajun Clucker!